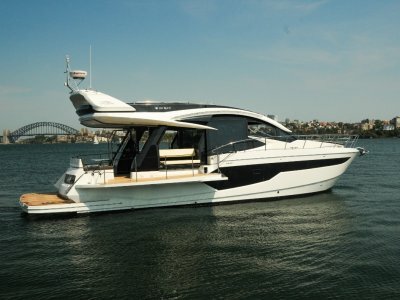 Alexander Marine Australia are proud to present this Grand Banks 52 Europa 'Serenity'. Her owner has upgraded to a larger Grand Banks and now 'Serenity' is to be sold. She is presented to the market in immaculate condition by her meticulous owner. 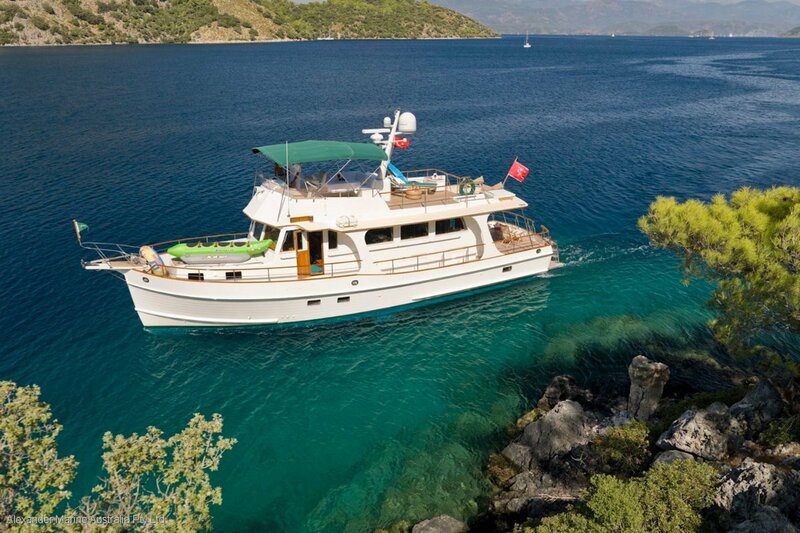 Even though the 52 Europa is a cruising vessel, she gets along in a most lady-like manner. She has a nice motion and feels solid. Powered by twin Caterpillars @ 420 hp each you have that turn of speed when you require it. Bow thruster assists for easy docking, and Naiad stabilized for extra comfort. A unique feature of this GB52 is the internal access to the flybridge from the pilothouse. Two substantial doors lead out either side for access to the side decks and the bow. Another unique feature is that the galley has been extensively remodelled with the clever use of stainless steel for the benchtops (rather than the usual Corian benchtops), twin large double stainless steel sinks with faucet, and the inclusion of a five burner gas cooktop with electric oven under. Large double drawer eutectic refrigeration is opposite with a single drawer eutectic freezer. The galley has been completely 'opened up' to flow through to the pilothouse giving unobstructed views from the cockpit through the saloon to forward of the vessel. The saloon is spacious with olive green suede seating in as new condition and teak and holly sole throughout. The joinery throughout this vessel is stunning! Accommodation comprises of a three cabin layout with full beam amidship master with a large couch on starboard side of the queen berth and study desk/vanity desk on the portside and with a very well equipped ensuite. To starboard is another double berth, and forward is an island double berth, both cabins share a guest bathroom. Access to the crew quarters is via the large cockpit entertaining area. Here you will find the washer/dryer facilities. Also doubles as a teen's retreat. Up top there's plenty of room for entertaining on the flybridge deck. Access is by a moulded stairway from the cockpit and through the internal pilothouse stairwell. The upper helm station is virtually a duplication of the lower one. There is extensive L shaped seating with a table and teak decks make it nice underfoot. A flybridge grill and wetbar make ease of entertaining and all is shaded by a large bimini. There are so many places for people to relax on this boat that the skipper would need to take a head count to make sure everyone was onboard before leaving the wharf or an anchorage. 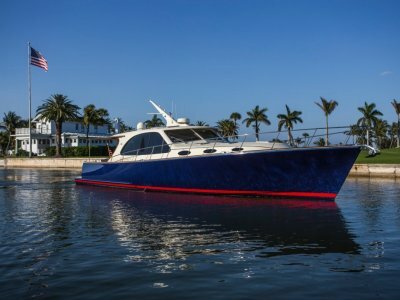 The Grand Banks 52 Europa is a fine, long-range cruiser with superb entertainment and living spaces. 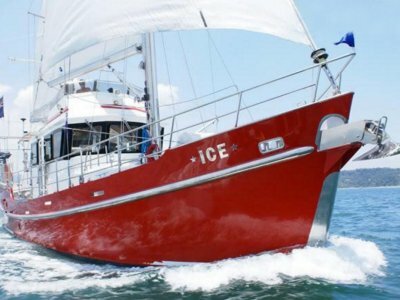 With accommodation for seven adults, this yacht has the space and dependability cruising boaters demand. One look at the spacious saloon and pilothouse and you'll see why the Grand Banks 52 Europa was designed with families and friends in mind. 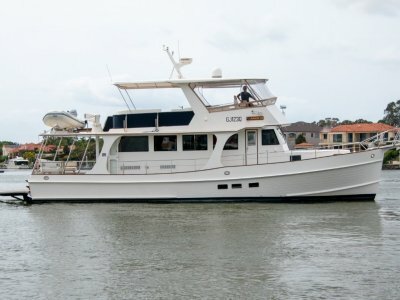 Backed by decades of Grand Banks history and refined boatbuilding techniques, the 52 Europa provides you with superior long-range cruising without skimping on luxurious living. Disclaimer: All care is taken to ensure that the information provided in this presentation is correct as specified by the owner of the vessel. Slight variations in specifications and photos may occur. Please note photos mayshow personal items and/ or items not included with the sale of the vessel. Teak flybridge, cockpit and side decks. Four cabin layout including single berth crew quarters or teenager retreat. Amidship full beam master with ensuite, lounge and study/make up desk. Double island berth forward which converts to two singles. Double berth to starboard with shared ensuite. Remodelled galley with the clever use of stainless steel benchtops. Bosch Dishwasher. National Microwave oven. Jabsco searchlight. Kahlenberg Airhorn trumpet. CO2 detector. Naiad Stabilized. Bennett Trim Tabs. Whirlpool washer/dryer located in crew quarters.